Another Friendly Edition sent us Another Great Release. This time Pietro Riparbelli a.k.a. 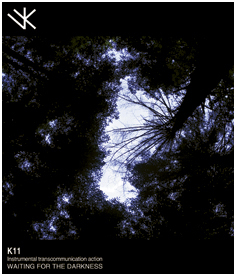 K11 (which should definitely not be mixed with K2) gives us a release based on sounds created by short wave radio receivers. Performed in the middle of the night, guided by certain frequencies on which transmissions took place, this release does not sound how you now think it will sound. It has nothing to do with detuned radio's or so, it's the opposite! The album consists of minimal noise-drones with sudden found footage and heavily distorted and manipulated themes. Five tracks with a complete playing time of almost 50 minutes and since we all know there is some space left in that case, Pietro added a 13 minute video on the remaining disc space. This video gives us some insight on the atmosphere of these nightly recordings: a flickering flashlight, shadows and here and there an overview of the forest. The title track sounds like a noisier variation of Lustmord in his earlier days. But even though the video track is gorgeous, the five tracks on the audio-section are worth it already. Overall quite a bit noisier then the before mentioned comparison to older Lustmord works, all works are strong in composition and choice of sound. One moment Pietro makes the receivers sound like a combination of overdriven, heavily distorted guitars, and at another moment he knows to capture moments of silence and create an isolationist atmosphere.